What now for Arsenal and Fabregas? Cesc Fabregas will be hoping for success wearing the No.4 shirt at the Camp Nou. As Cesc Fabregas was unveiled at the Camp Nou on Monday, ending one of the longest-running transfer sagas in recent memory, two new stories were born and neither currently has an obvious ending. 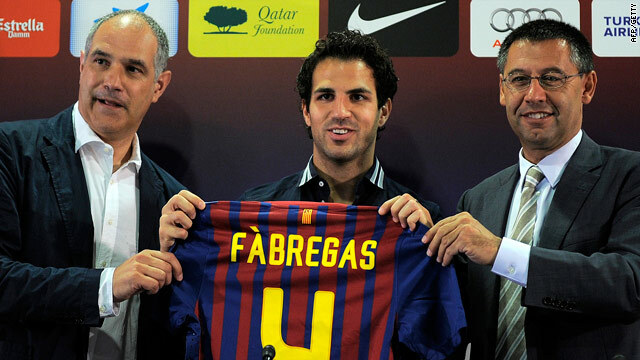 First, the tale of "Fabregas: The Barcelona Star?" and second the epic legend of "Arsene Wenger's quest for Glory." Let’s start with Wenger. If you read my blogs regularly, then you know I think the French manager has lost the plot at The Emirates. For too long he has failed to see that the team desperately needs veteran players who are proven winners and who can add character to a side which has been too soft too many times. In this preseason, he has once again insisted in spending a lot of money ($43 million) on a group of youngsters instead of investing in experience. Wenger’s persistence in following a model based on youth has alienated some of the senior players in his squad and in my mind that is one of the reasons why Cesc decided to go. Of course the midfielder wanted to go back to Barcelona where he started his footballing career and where he has his oldest friends and family. However, I can guarantee that if Arsenal were winning trophies, and if he believed in Wenger’s master plan, he would not be jumping ship. I honestly think he got tired of seeing the team fall short of expectations and of shouldering too much of the blame. He became captain at the tender age of 21 and in my view had to deal with too much pressure, too soon. So, what is the next chapter for Arsenal? Well, I am pretty sure Samir Nasri is going to leave as well, so Wenger has to find a way of replacing two superstar players in a couple of weeks. Not an enviable task and the French coach has to realize it is now or never. He has to spend big money on big players who know how to win and know how to win right now, or I fear an unhappy ending. As far as Cesc is concerned, it will be fascinating to see whether he can adapt to a new role at Barcelona. At the Camp Nou, he will be merely a squad player. Fabregas normally has played second fiddle to the likes of Xavi, Andres Iniesta and Sergio Busquets with the Spanish national team, and that is probably going to happen at Barca as well. He has been bought to add depth to midfield and to allow Pep Guardiola to give his maestros some rest. Whether he plays week in and week out, I think that is very doubtful right now. He may get more first team action if Pep decides to move Iniesta out towards the wing opening up a slot for Cesc to play alongside Xavi in the middle of the park. Ultimately though, he is the future and his stellar story is set to only get better in the coming years. I am genuinely interested in what will happen at Arsenal and Barcelona over the next couple of weeks. How will the Gunners rebuild, and how will Barca cope with their embarrassment of riches keeping everyone satisfied? Watch this space, because when all is said and done both Wenger and Fabregas are the sole authors of their respective fates. Arsenal will be better without cesc and let other players to be more committed for the club. I Believe Arsenal is there to stay top as it has always been but one thing, Wenger has to try to win silverware this time round. Fabregas or no Fabregas, i believe arsenal will make it this season and the future to come. Pedro,you always seem to joggle up interesting views and this isn't an exception. Arsene wenger has shown he is a stubborn man,refusing to listen to others and I tell you it will not be long before the exit door is shown to him. Am not an arsenal fan but I know the fans of that club wouldn't continue to be patient with him for another one,two seasons to come. Cesc was great and He will be missed but I believe Arsenal and Arsene will take care of that. Arsenal need more experienced players in order to excel and win silverware.The absence of Fabrigas is a fate to the club because the guy was very skillful and tactiful.Arsenal should tie Nasri if they want to remain at least stronger and Nasri also quit then Arsenal remains in cross road. It is obvious that wenger has lost it all. When Arsenal were winning trophy about six years ago, they were mist with veterans that can holds their own against any big team. Wright now arsenal has become a training club for others club to pick their best player because of the philosophy of wenger eccept he change arsenal will find themselves behind the champion league sport. Wow CNN put up Arsenal news on their front page. Hopefully this is our year!!! Fab gone so not so Fab but in recent years in my opinion has not been a crucial figure around Emirates. i generally think you're a hack. however, this time i agree. but it's only logical to think in such a way. if wenger doesn't bring in that creative midfielder, that dominant CB, a utility guy (why get rid of eboue? dumn move), we will again fail in the season. then, wenger's legacy will be the failed final years instead of all the good he has done. Am a die hard fan of Arsenal.please some one should tell arsene wenger to stop giving us heart attack every season.he should deep his hand in the transfer pocket and sign a world class players that can win us trophy. He should stop relying on a fringe players.please mr. wenger we are tired of being forth position,we wont to be come champion of England.To be frank Arsenal cannot reach any where with this fringe players.I hope mr. wenger will put smiles on our faces by the end of this season. In my own opinion, wenger should stop treating his fans like they don't matter. with the exit of these two great guys,i foresee some negative impact on Arsenal Perfomance this season. For how long shall we wait againg to feel the wonderful beauty of being a champion that we were in the past with the the unbeaten record we've set. Still on still Arsenal is my Club and and am still very proud to a fan. I just pray miracle will happen at the long run. Good luck to CF, but why is that Arsenal always wins big matches when CF is not playing? Last seasons win over Manchester United and Chelsea are examples ... his leaving may just be good for Arsenal ..or at least I hope so. This is for you cesc, youre one of the few players who have truly felt sadness for arsenal, you are true to yourself and the club. Hope you do well at Barcelona. I would say the author is totally wrong in assuming that Cesc left because of the lack of veterans being signed. He left for 2 very simple and obvious reasons. First, he is returning home to his family and friends, where he grew up. Second, he is going to Barca to WIN - something Arsenal have not done in years. Its a painful moved(Cesc to Barca) for the Gunners fans and wenger but no worries i'am sure there is also an answer to every problem and the answer to this_Persie will response. To be honest Cesc has not done so much for Arsenal in the recent seasons. If Arsenal wins a trophy with a young team, it will be dominant for the next decade. Wenger appears to be patiently building that team. He has managed to keep Arsenal in the Champions League while building and that is not an easy feat. If he succeeds, he will have his legacy. If not, people will lose patience and demand his head. I hope he succeeds. Meanwhile, how come no one is talking about the acquisitions he did make. They are young but show a lot of promise. Has anyone acknowledged the pending issue over players wages in Spain, or the tanking of that country's economy? Or that UEFA's new ruling kicks in next year where clubs can't spend more than they earn? Did anyone else read Gary Neville's...yes Gary Neville...defence of Arsene and his model for the sustainability of the football club that is about to celebrate 125 years of gracing the world's game? I've been a Gunners fan for 33 years from the island of Trinidad & Tobago. Been through highs and lows, and I won't give up on my team. For those who want instant gratification, go support the teams that are trying to buy a title. Completely agree with your comments Pedro. I stopped watching this Arsenal side, because even though they play great football, they lose on way too many occasions because of their lack of experienced players, especially in defense, with them leaking goals and giving up 2-, 3- and even 4-goal leads! I mean for how long can this keep up!! And they were always rescued by their creative passing style that got them near the top of the league, but now that seems to become a distant memory, as their free scoring will soon dry up, with no Cesc to provide opportunities for the forwards, and Nasri on his way. Arsenal's only hope is that Walcott shows the performance that Arsene believes he is capable of, and Van Persie has an outstanding injury-free season. Otherwise no Champions League next year. This is a beautiful article,I don't think anyone could have put it any better! Fabregas has been accused of jumping ship too soon but in my book 5 trophy-less years is an eternity in football for a world class player and for those worried about him playing second fiddle to Xavi and iniesta,my view is that every player who deserves to be in the starting 11 will be in it regardless of which team mate he found in the position..all fab has to do is show his worth! I will end my humble contribution with a dig at Arsenal fans who are furious at his departure,Barca has offered Fabregas silverware in 3days!!! Something the gunners couldn't do in 5years! This is a poor article cobbled together from other inane opinion pieces. Zero insight, second-rate conjecture and cliche. If you are impressed by this you are not using your search engine: type in Arsenal and find a plentiful supply of insipid comments that belie an understanding of the crisis at Arsenal. Financially the club are in rude health, but that has it's price. The fans grumble but as long as the bottomline is good why should the board give anymore than lip service to their demand for trophies. For, in soccer, winning has become a Kamakazi game: the price of trophies is perverse when you consider the financial state of the winning sides; either borderline broke or the plaything of oil dealers. Arsenal have strict wage structures. Psychologically it is demoralising to give your all as a player knowing there are better deals elsewhere. Inexperienced players bottling on the big stage and lack of depth of squad is what happens when you have fiscal discipline. wenger will distroy arsenal.fabregas leaving okay. i keep on saying this Arsenal is a nursery where players are being breeded for wise club to buy and win trophies. Arsene seems to have lost the plot . . . . . . .a bit. He does have the resources and acumen to a) buy established players 4 d team b) groom a new team from the pieces he currrently has and if Nasri stays, has the base of a strong tem, maybe not title winners but not all doom and gloon either. Fabrigas, i comment his effort, he is a kind of player fans would n't want to miss still that does not mean a club like arsenal can't do without, we need good striking and defensive force, wenga stop pricing players without buying them soon fans will lost hope and interest for the club. Just for your storboness. ansenlwenger,is a bunch of dissapointment,and i dont think nothing good will come out of ansenal again this seson ,except he buy s big players that are goal oriented. Failure is not final, Wenge will rise again. Right from the word go, Cesc has been making waves in Barça colours. Watch out the Gunners will rise again. Good luck to the footballers and fans at Arsenal.